Verify the chemical identity of raw materials and products. Quick, reliable and universally applicable identity control of incoming raw materials. Determine the chemical reason behind product failure. Spatially resolved analysis of contaminations and inhomogeneity. 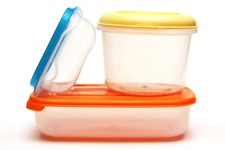 Increase the knowledge about your product's composition. Selective analysis of individual components in complex materials. Identify the composition of competitor products. 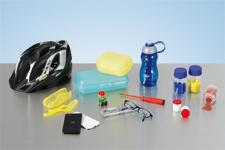 Reliable quality control is essential to achieve a cost-saving production of high quality plastic products. Bruker’s ALPHA II provides a FTIR spectroscopy based solution for powerful routine quality control of incoming goods, intermediates and final products. In case of any product defects an effective failure analysis is required to understand the source of error. The FTIR microscope LUMOS is a valuable analytical tool for troubleshooting as it allows to determine the chemical composition of smallest structures. 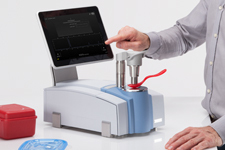 Moreover LUMOS is a helpful tool in product development and reverse engineering as it provides information about the chemical composition of materials and products in the micometer scale. Read summary about the IR-capabilities in QC and failure analysis of polymers. 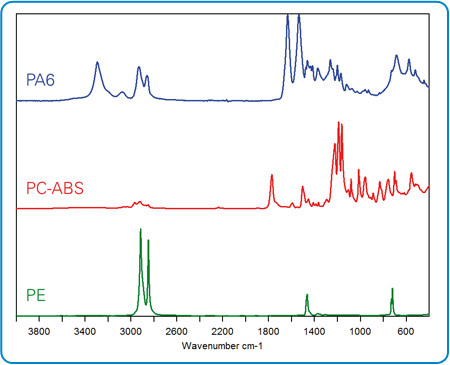 Read application note about IR-spectroscopic polymer analysis. The IR-spectrum of any sample reflects its molecular composition – just like a chemical fingerprint (Fig 1.). Both organic and inorganic chemical components contribute to the sample spectrum. 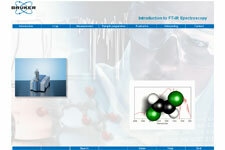 Therefore the IR-method is very suitable to identify as well pure compounds as complex materials. Furthermore the quantification of individual components inside the analyzed material is feasible. Learn more about IR-spectroscopy using our interactive tutorial (>80 pages). For most samples the FTIR analysis is performed without sample preparation and without the need of any consumables. 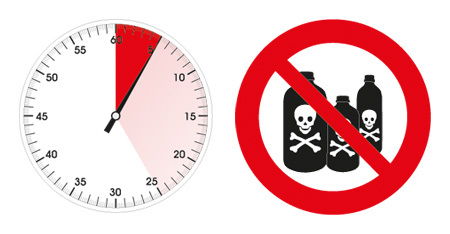 Measurement times are typically below 1 minute. Therefore, FTIR spectroscopy saves your time and cost when being compared to classical wet chemical methods. Bruker's IR-spectrometer systems are designed to be used for many years. Our IR-instruments utilize modern high quality optical components with a guaranteed long lifetime. Adding the low energy consumption these outstanding characteristics result in minimal running costs. Learn more about the 10 most valuable benefits of using IR-spectroscopy for QC and failure analysis. How Bruker has been driven by the idea to always provide the best technological solution for each analytical task for more than 50 years now.